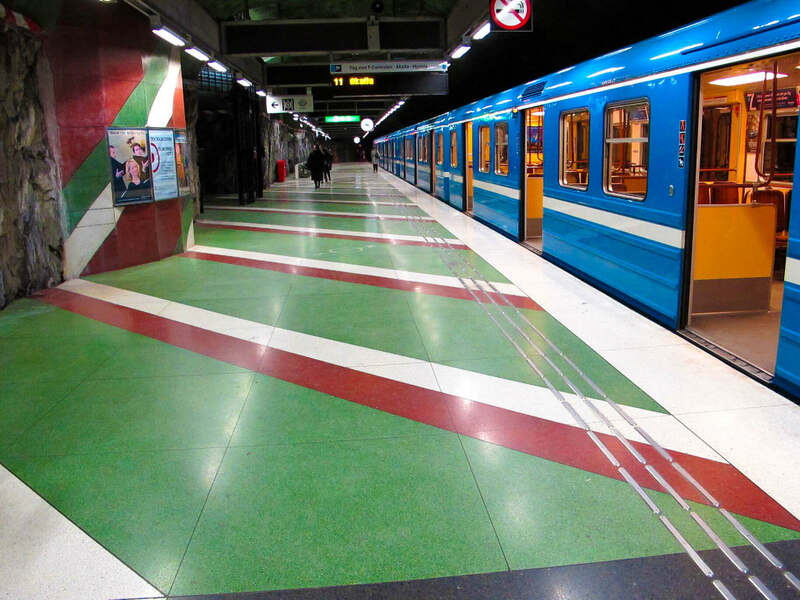 At 110 km long, the Stockholm metro system is often called “the world’s longest art gallery”. More than 90 of its 100 stations have been decorated by artists. Intrigued by the photos I saw when I Googled the Stockholm metro, I decided to check out the most famous stations during my trip to Stockholm. I spent hours one afternoon wandering through different stations, admiring all the colourful artwork and taking photos. In fact, I loved the Stockholm metro so much that I wish I had planned a longer stay in Stockholm so that I could have spent more time exploring it! For your self-tour of the Stockholm metro, I recommend printing out a map and planning out your route beforehand. Set aside at least three hours for exploring the different stations! To pay for your journey, you can purchase an electronic smart card and load money on it, or you can buy 24, 72 hour or 7-day travelcards. At T-Centralen, Stockholm’s busiest station, the blue vines and flowers are meant to soothe passengers as they connect to different lines. On the ceilings, you can also see the silhouettes of workers. Artist Per Olof Ultvedt wanted to honour the hard work of the welders, carpenters, steelworkers, engineers, and miners who worked at the station in the 1970s. Makalös Palace used to stand above this station and various 17th and 18th century artifacts are on display here in glass cases. Ulrik Samuelson painted green, red, and white lines that run along the floors to symbolize the old Baroque garden of the palace. Green symbolizes the green garden, red symbolizes the gravel pathways and white symbolizes the marble statues that used to be in the garden. This colourful station is meant to feel like an underground garden! The bright colours of the rainbow at Stadion symbolize the colours of the Olympic Ring. Enno Hallek and Åke Pallarp designed this art in 1973 to commemorate the 1912 Stockholm Olympics. Located nearby the Royal Institute of Technology, this station’s artwork features the four classical elements (fire, air, water, and earth). Sculptures like this dodecahedron represent technological advances. Walking through this station feels like being in a cave. Radhuset is based on organic architecture, which leaves the bedrock exposed and unsculptured. The red and green colours of Solna Centrum depict a green forest and red fiery sky. Painted by Anders Åberg and Karl-Olov Björk in 1975 during Sweden’s industrial era, the artwork is meant to highlight the issues of rural depopulation and destruction of the environment. The painted green forest is 1000m long and stretches along the walls of the entire station! Created by Helga Henschen, the art of Tensta station celebrates the diversity of immigrants who live in the area. There are paintings with the word “brotherhood” written in 18 languages as well as sculptures of animals and plants. The art in this station was designed by Lars Arrhenius. It features popular characters and symbols from vintage video games and early computer systems. I visited Stockholm in 2012 and stayed there for 4 days. I did use the metro line but I think I just missed noticing the beautiful art. I love such interesting elements which enhance travel experiences. Awesome! It would be so fun to go on a subway trail to check out these art! The lighting makes everything really dramatic as well! I’m wondering about the costs to visit all these stations, did you buy a pass? OMG these are amazing pictures!!! I wanna visit now! Thank you! Yes, definitely visit if you get the chance! This is awesome! I especially love Stadion and Tekniska högskolan. What a great way to brighten up your commute, and make public infrastructure a happy place to be! The stations look amazing – I didn’t realise that Stockholm has such beautiful metro stations! I’ll hopefully visiting soon so i’ll make sure to set an afternoon aside to explore them. The subway looks so amazing. I actually visited Stockholm about 5 years ago but didn’t know they had such amazing art! I need to head back. Two questions. 1. Which do you think was your favourite station and why? 2. Do you know why it was painted and decorated in such a way. Did the Stockholm government want to do it to attract visitors etc? I was so impressed by the subway! Yes, a lot of people don’t know that all this amazing art is right under their feet! 2. No, it wasn’t to attract visitors. It was more for social and political reasons. The Swedish Social Democratic party wanted art to be accessible to all citizens, not just wealthy people. So when the Stockholm subway opened in the 1950s, the Social Democrats hired artists to decorate the stations! And in the 1970s, the art became more political- intended to draw awareness to issues like deforestation and women’s rights. This is so cool and definitely one of the reasons why I want to travel to Stockholm again, luckily it is only less than an hour by plane or an overnight boat ride from Helsinki. Thank you for sharing! Oh such amazing art work. It makes me want to go to Stockholm right now. How fun is that? If only subways were like this everywhere! I must say St. Petersburg metro is pretty impressive too! Just WOW! The art work around the subways of Stockholm is just incredible!!! I would love to visit – your pictures have really captured the work too! Thanks for sharing, one more reason I need to get booking a trip!